For children and infants, the Lund-Browder chart is commonly used to assess the burned body surface area. Different percentages are used in paediatrics because the surface area of the head and neck relative to the surface area of the limbs is typically larger in children than adults. 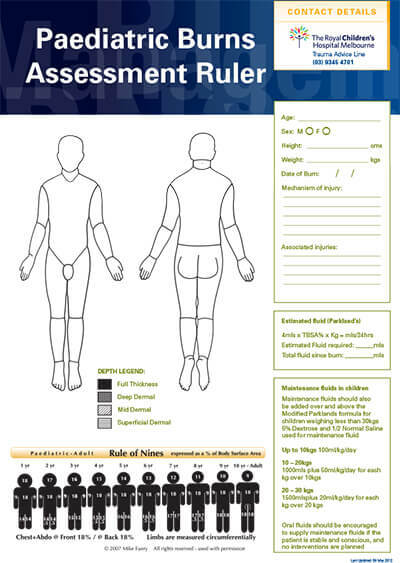 The attached chart is an adaptation of the Lund Browder burns assessment chart which provides for rapid body surface area assessment. A diagramatic representation of body surface area percentiles for each peadiatric age group are provided at the bottom of the chart. Select the patients age from the series of diagrams to determine body surface area ratios for each body area to calculate burn size.